William Shakespeare is not everyone’s cup of tea, but his work has well outlasted him and is being produced regularly throughout the world so, he must have done something right. His stories are timeless and can relate to anyone in any era which is what, I think, helps the longevity of his work. 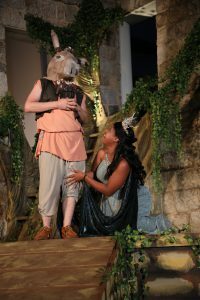 The comedies are my personal favorite, but, that’s just me, and Chesapeake Shakespeare Company’s latest offering, A Midsummer Night’s Dream, is on top of my list so, I went in with lofty expectations. However, this production, Directed by Gerrad Alex Taylor did not disappoint in any way. 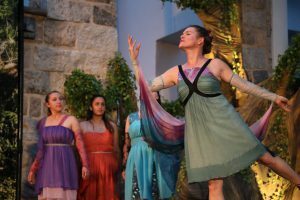 Briefly, A Midsummer Night’s Dream is a fanciful triste through the city and wood of ancient Athens. A young woman, Hermia, is betrothed to one noble man, Demetrius, while in love with another, Lysander, who just so happens to be in love with her. Bring in Helena, who is in love with Demetrius, but the feelings are not mutual. Enter the Fairy King, Oberon, and Fairy Queen, Titania who are having their own lover’s quarrel, and a sort of practical joke including dew from a certain plant that makes a person fall in love with the first person they see after waking up. Throw a little troublemaking imp named Puck in the mix and you have a farcical comedy that has lasted hundreds of years… for good reason. Designing a set for an outdoor setting can be challenging but Daniel O’Brien’s Set Design is impeccable as it is simple. Not calling for much in the way of scenery, O’Brien has managed to turn this small corner of space in the midst of “ruins” of a building at a historic park into the solid and larger than life Athens, as well as a blissful and fanciful forest in which fairies and imps romp, all with the opening and closing of two large canvases. It works beautifully with the piece and adds great value to the production as a whole. For Costume Design, Heather C. Jackson chose to keep it traditional with colorful flowing robes and sashes that work extremely well for this traditional setting. Her design is well thought-out and the ensemble seems comfortable in their wardrobe which helps the overall performance of the piece. It’s apparent she’s familiar with the both the era and the fanciful theme and it shows in her impeccable design. Gerrad Alex Taylor take the reins as Director of this production and it couldn’t be in better hands. His choice to use a traditional setting is wise and takes everything back to basics. So many companies like to adapt and modernize Shakespeare’s work (which I’m all for), but it’s good to see that the traditional setting still works and works brilliantly. Taylor has a strong comprehension of the material and his whimsical and fantastic vision is clear in every scene. The pacing is on point and the staging is engaging every step of the way. Taylor also takes on double duty as Fight Choreographer and he hits the nail on the head with this aspect, as well. Each fight is finely tuned and exciting making for an overall delightful experience. Kudos to Gerrad Alex Taylor for a superb production. Moving on to the performance aspect of this production, I’d be amiss if I didn’t mention that the entire ensemble did their part and performed with 100% effort. It’s easy to see this cast is comfortable with each other and their chemistry is second to none. Michael Toperzer as Oberon and Elana Michelle as Titania shine in these roles, as well as their takes on the characters of Theseus and Hippolyta. Their interaction with and off of each other draw the audience in and Toperzer and Michelle portray the complex relationship between Oberon and Titania beautifully and with confidence making for intense and engaging performances from both. Christine Watt as Peaseblossom, Abigail Funk as Cobweb, and Sydney Thomas as Mustardseed are the perfect complement to Elana Michelle’s Titania and these three play their characters to the hilt. They, too, work well with and off of each other to create a tight circle that moves the dialogue and story along nicely. All three actresses are well rehearsed and well suited for their roles. 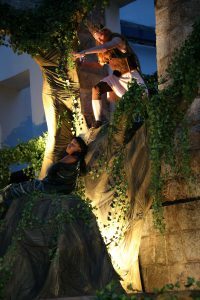 The story revolves around two couples, mainly, and Nina Marti and Rafael Sebastian portray Hermia and Lysander, the two forbidden lovers. Marti is a firecracker and as the script states, “…she’s fierce, even though she’s little.” and that’s exactly what she is. Marti has a tight grasp on the text and performs it effortlessly while Sebastian, too, portrays Lysander with just the right amount of innocence and a young man’s lust making for commendable performances from both. The other unfortunate couple, Demetrius and Helena, are portrayed brilliantly by Nick Fruit and Kate Forton. Though their characters start out as anything but a couple, through a little bit of magic and luck, they end up happily joined. 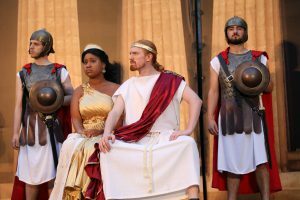 Fruit plays the uppity Demetrius well with confidence and grand gestures but also understands and does well with the slapstick that is required of the character. Likewise, Forton is stellar in this role. She completely embodies this character and it’s easy to see the love and passion she has for this character and the piece as a whole. She has a strong stage presence and gives a natural, seemingly unscripted performance that makes her a highlight in this production. Fruit and Forton work well off of each other and their timing is flawless making for a delightful and strong performance, overall. Young Imani Turner, still in high school, tackles the role of Puck, the little trouble making imp who doubles, at times, as narrator of this story. This young actor is a true talent and his instincts and natural ability are apparent as he portrays this comedic character with just enough mischief for him to irritate but with a mix of a bigheartedness, one cannot help but like this character. His delivery and comedic timing is on point and I’m looking forward to seeing more of his work in the future. The Athens acting troupe, also known as The Rude Mechanicals consist of Colin Connor as Peter Quince, Brenden Edward Kennedy as Francis Flute, Tim Neil as Snug, Owen Halstad as Robin Starveling and the casting of these gents is superb. All of them comedians and the performance of their featured part, the play within a play called Pyramus and Thisby will have you rolling in the isles. It can be seen as the play that goes wrong, and it was one of the most enjoyable moments of theatre I’ve encountered this season. Connor, Kennedy, Neil, and Halstad show off their comedic timing and slapstick abilities impeccably and have the audience roaring with laughter. This crew is certainly a highlight of the production. Another member of this troupe is standout Jose Guzman as Nick Bottom. Seemingly a vain and obtuse character, Guzman plays Nick Bottom to perfection. Guzman has a complete grasp of the text and plays it over the top, but not so over the top as to be annoying… just the right amount. Guzman is a force to be reckoned with onstage with a strong stage presence and a natural comedic ability. You can’t miss him in any scene he is in whether he is speaking or pantomiming in the back and his delivery is spot on. He’s certainly one to watch in this particular production and I can’t wait to see future performances from this actor. 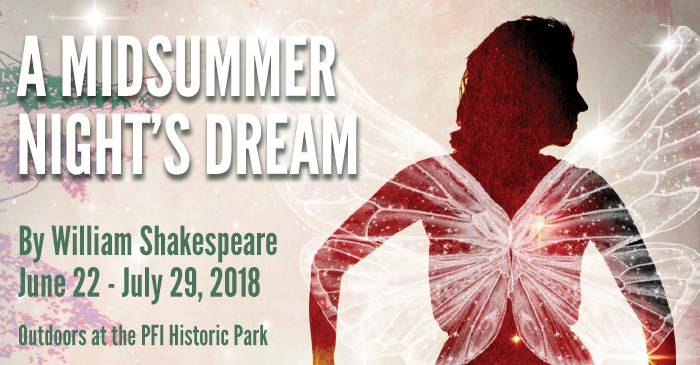 Final thought…A Midsummer Night’s Dream is not a show you want to miss this season. The production is top-notch in every aspect and the setting couldn’t be more picturesque. From the scenery to the staging to the performances, this production of a Shakespeare favorite will not disappoint and makes for an absolutely delightful evening of theatre. The thought and care that went into this performance is apparent and the actors, who are giving 100% of their effort and passion, make this a successful retelling of this classic comedy that will have you doubled over, laughing, and engaged every step of the way. Get your tickets now! 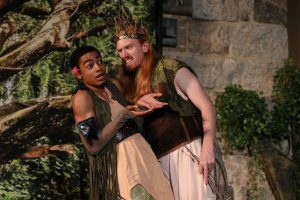 This is what I thought of Chesapeake Shakespeare Company’s production of A Midsummer Night’s Dream… What did you think? Please feel free to leave a comment! 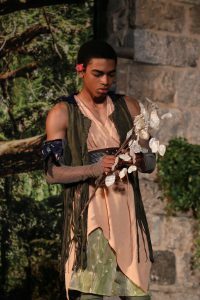 A Midsummer Night’s Dream will play through July 29 at The Patapsco Female Institute Historic Park, 3655 Church Rd, Ellicott City, MD 21043. For tickets, call 410-244-8570 or purchase them online. Bah Humbug! It’s a phrase familiar to most who know the story of old, crotchety Ebeneezer Scrooge from Charles Dickens’ A Christmas Carol. The story teaches many lessons including compassion, empathy, and love, especially around the holidays. So, it’s popular story and has been adapted countless times for both stage and film so, there’s always a risk that most of the theatre companies in any particular area will rush to present their own version of this staple of the holiday season. With about 15 productions going on in Baltimore at the same time, Chesapeake Shakespeare Company has joined the fray to mount their latest production of A Christmas Carol, adapted and Directed by Founding Artistic Directory Ian Gallanar, with Music Direction by Grace Srinivasan, Choreography by Nellie K. Glover, Set and Lighting Design by Daniel O’Brien, and Costume Design by Kristina Lambdin, giving a traditional look at this classic with a good old Baltimore twist. Set and Light Design by Daniel O’Brien is simple, but impressive. A bit minimal as it is a unit set but using various set pieces to represent times and places makes for an efficient design to help move the story along and O’Brien’s attention to detail for each well-chosen piece gives the production a more authentic feel all around. His Lighting Design is also a well though-out design as it sets the mood for each scene adding a little creepiness when needed as well as bringing a particular brightness to the more lighthearted scenes. Kristina Lambdin’s Costume Design are nothing less than superb. Her attention to detail and craftsmanship is top notch, taking the audience back to the Victorian era with its layers and subdued, earthy colors. Each character was dressed appropriately and seemed to be as comfortable as can be in the style making for a very intelligent, authentic design. Choreography by Nellie K. Glover is delightful and upbeat for the numbers requiring dance and merry-making. In numbers such as the Fezziwig party scene, Glover keeps the chorography engaging and in the style of the era in which the production is set, adding to the authenticity of the entire piece. The cast seems to have a blast performing the choreography making for a fun, energized performance. Grace Srinivasan’s Music Direction is admirable as we are treated to traditional carols such as “God Rest Ye Merry Gentlemen,” “Coventry Carol,” and “We Wish You a Merry Christmas” that fit very well with this production. Srinivasan has this ensemble singing in harmony and has well-chosen featured vocalists. There is actually a very good balance of music in this production and Srinivasan’s work adds value to this production. Founding Artistic Director Ian Gallanar wears the hats of both Director and Adapter of this production and, overall, it’s a good showing, but it does have it’s flaws. First off, setting the story in Baltimore is endearing and charming indeed, but the reminders of this in what seems every other line can get taxing and give the appearance of trying too hard. He didn’t change the time, just the place and because of that, it frankly doesn’t change much. Spouting out Baltimore street names and places is more like filler rather than important to the story line making the script seem a bit trite. He may have been a little more successful by keeping the story in tact, completely. As for his Direction of the production, it’s commendable keeping this large cast in sync, but the staging is a little flat. For instance, the fateful meeting between Scrooge and the Ghost of Marley is very lackluster and moves along at a snail’s pace, as do other scenes. Most of the performances are admirable with a well-cast, dedicated ensemble, but the staging and script somewhat hinder some of the phenomenal talent onstage. Overall, pacing was okay, but transitions were a bit clunky and slowed the flow. That being said, it’s clear Gallanar has a good comprehension of the story and the message it sends as well as a good understanding of these characters. The audiences are definitely entertained, but a little more work on the text and staging would do well for this production as a whole. Moving on to the performance aspect of this production, Scott Alan Small takes on the role of Bob Cratchit, Scrooge’s gentle and compassionate clerk and Gabriel Hoch tackles the role of the ill, but positive Tiny Tim. Small gives an admirable performance but it does fall a bit flat throughout. He has a good grasp of the character but is stiff and scripted throughout. However, he has good chemistry with this ensemble and is confident onstage. Gabriel Hoch, one of the many children in this production also gives a good showing and is a good fit for this role and understands its importance, giving a good sympathetic spin on this character. When it comes to the many children in this production, all seem to be simply going through the motions – reading their lines and moving to their marks. A little more work with the children may have benefited their performances just a tad. There are quite a few ghosts or spirits in this production and Keegan Cassady takes on the role of The Ghost of Jacob Marley and, though he portrays a very creepy ghost, the performance seems called in but this may be because of the staging. For such an important scene, I wanted more from The Ghost of Jacob Marley, not just a walking around banging chains. It looks great, and Cassady does what he’s supposed to do in being scary, but he could step up the intensity. Ashly Fishell-Shaffer portrays The Ghost of Christmas Past, Larry Malkus takes on the Ghost of Christmas Present, and Elliot Kashner performs the silent role of the Ghost of Christmas Yet to Come. Fischell-Shaffer gives a fantastic, whimsical portrayal of the Ghost of Christmas Past and gives the character a good balance of empathy and sternness that the character requires to help Scrooge remember better times, as well as not so happy times that shaped him into the man he is. Larry Malkus is a dominant, confident Ghost of Christmas Present and gives a strong performance as the traditionally robust and hearty character. 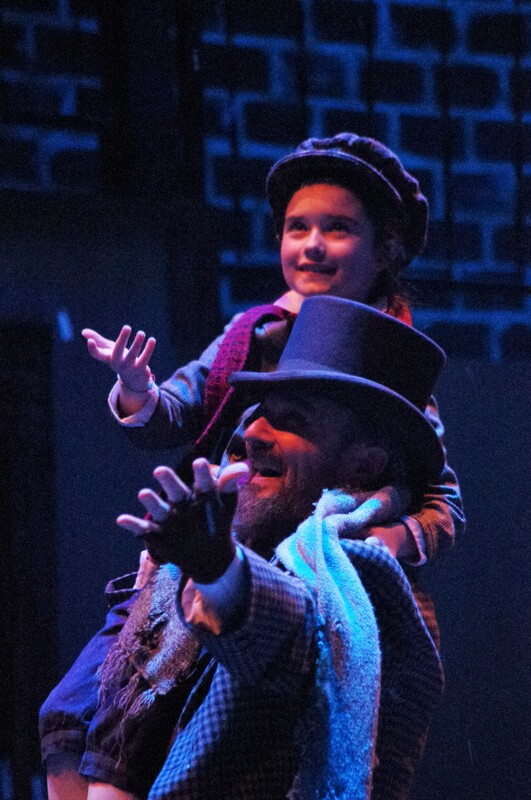 Elliott Kashner does take on the shadowy role of the Ghost of Christmas Yet to Come, but he is a highlight of this production as Fred, Scrooge’s young, hapless, and congenial nephew. 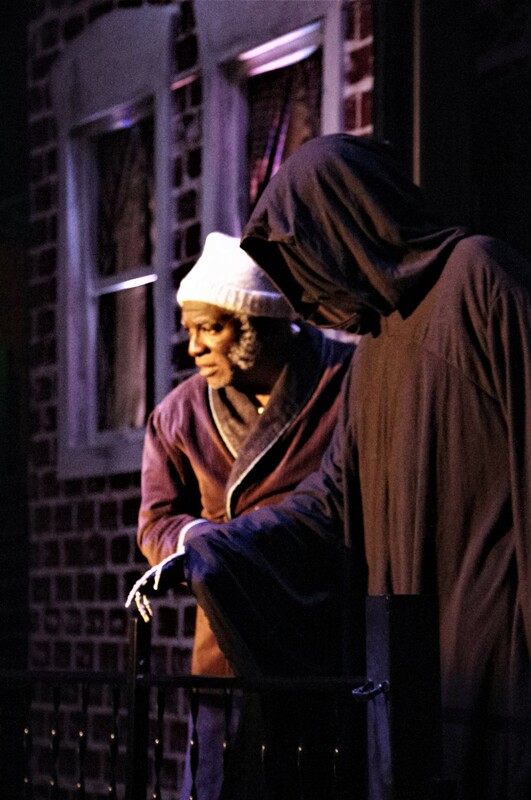 Kashner gives a committed and strong performance as the counter to the curmudgeon old Scrooge and keeps up his energy throughout the production. A featured scene, a Christmas party along with his wife, Dorothy (Alana Michelle), Topper (Bart Debick), and Caroline (Kate Forton), is natural with a good chemistry between all of the actors. Forton gives a particularly humorous performance of a young girl who’s had a little too much egg nog. 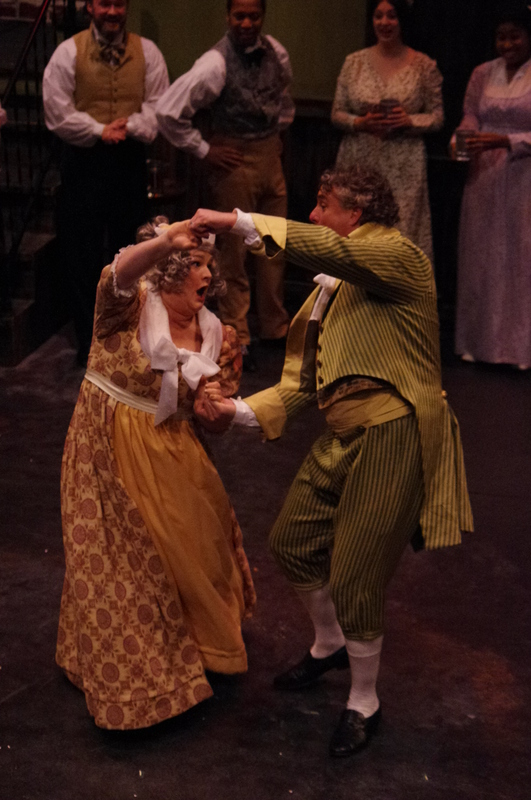 Two standouts in this production are Larry Malkus as Mr. Fezziwig and Kathryne Daniels as Mrs. Fezziwig. This scene during a point in Scrooge’s past is always a high-energy, upbeat scene and Malkus and Daniels take it to the hilt. They both give strong, energetic performances with a natural flare that make these characters likable from the moment they step onstage. Gregory Burgess is superb as Ebeneezer Scrooge and has a tight grasp on this character and what he’s all about. His transition from the beginning of this story to the end is seamless but noticeable, as it should be. He has a strong presence and a great command of the stage making him an ideal Ebeneezer Scrooge. There are a few curious choices he makes portraying this character such as a screeching yelp I believe is supposed to be comical but comes off more jarring than anything and a tendency to over-act with large, sweeping gestures and exaggerated facial expressions. Regardless, Burgess portrays this popular, well-known character with a natural ease and succeeds in transitioning Scrooge from a stingy, heartless old man to a loving, compassionate being who has really learned the meaning of Christmas and the love of your fellow man. 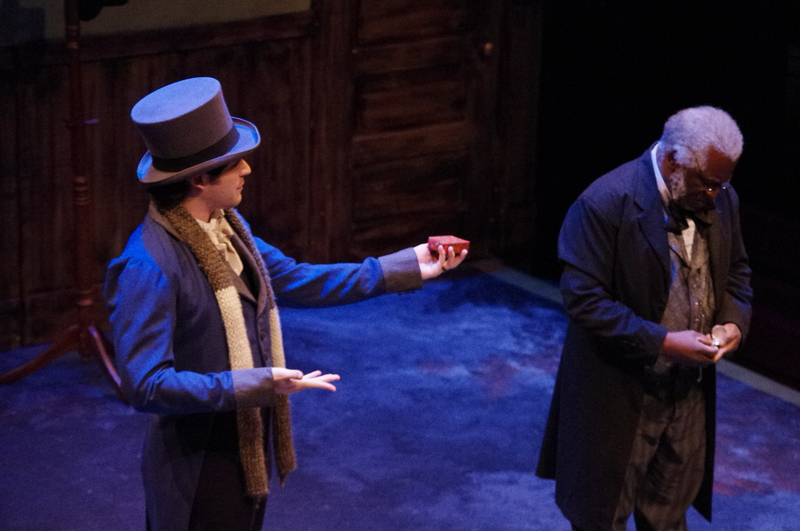 Final thought… A Christmas Carol is a timeless tale that can be challenging to give an overall fresh look. Some adaptations are successful, some are so-so, and some are downright painful. I’d put this production at Chesapeake Shakespeare Company in the middle category of so-so. Don’t get me wrong… the production itself is quite good and the audiences seem to enjoy it immensely. Most of the performances were top-notch and dedicated, the costumes were on point, the music selections are appropriate and well-rehearsed, the Set Design is spot on, and all technical aspects of this production work nicely together. The problem lies in the script and the attempt to bring Baltimore into the equation. This story is such that it can be set anywhere, but the setting is not so important as the lesson taught and being reminded that we are in Baltimore every five minutes got downright annoying. We get it. We’re in Baltimore. It’s cute and it helps the audience make a connection, but sometimes it’s best to air on the side of moderation. As stated, overall, it is a well put-together, focused and, even though there are about fifteen other productions of A Christmas Carol happening in the area, this is a production, aside from a few minor flaws, worth checking out during the holiday season. 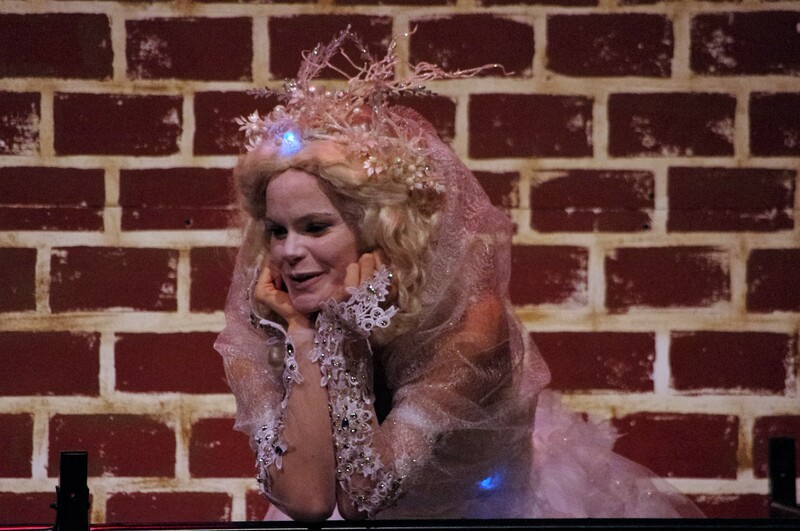 This is what I thought of Chesapeake Shakespeare Company’s production of A Christmas Carol… What did you think? Please feel free to leave a comment! 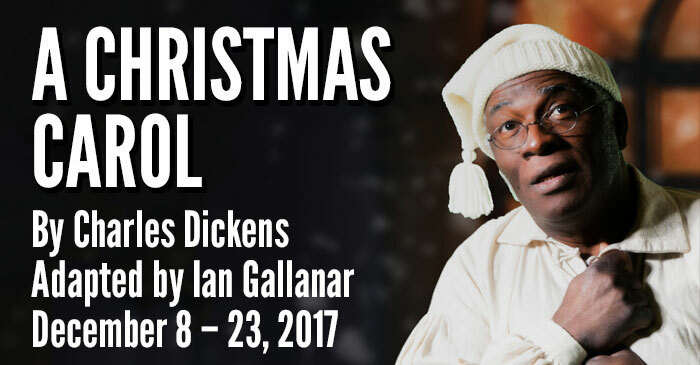 A Christmas Carol will play through December 23 at Chesapeake Shakespeare Company, 7 South Calvert Street, Baltimore, MD. For tickets, call the box office at 410-244-8571 or purchase them online.